Elliott wrote: This is unbelievable. I really wish Damien Hirst would just crawl into a hole and never be seen again. This is an excellent decision. Hirst stands for extreme amounts of wealth generated through confidence trickery and his output has no aesthetic quality or use whatsoever. The perfect symbol of modern Britain. Looks like he forgot to add the stretch marks and edema, and the bags under her eyes because she can't sleep with the baby kicking her ribs. In real life that level of pregnancy is ridiculously unglamourous. Apparently he's made a couple of naked pregnant sculptures. Maybe I'm jumping to conclusions, but, Mommy issues, anyone? 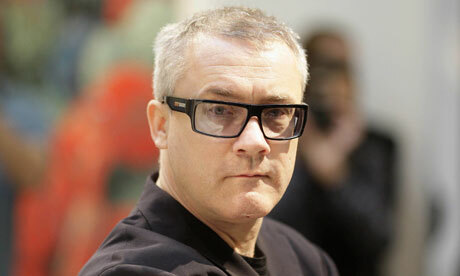 Damien Hirst is the definition of a charlatan. I despise him. Even his stupid ironic glasses are intended as an invitation for you to be annoyed with him, and he gets some sort of pleasure from that. He's like a little boy running around annoying everyone because nobody is prepared to give him a smack. Amazingly enough, even a Guardian journalist agrees with me! Heather, Hirst probably has made* quite a few naked sculptures, but I doubt it has to do with Mummy issues so much as a pathetic desire to shock. This one for example. Why must she be naked? Why must she be pregnant? Why must she be a teenager? What have nakedness, pregnancy or teenage pregnancy got to do with justice? What has justice got to do with a British seaside town? Absolutely nothing! There is no connection between these things. And why must the statue be 66ft tall? The whole project is deliberately meaningless, and is just a way for Hirst to advertise himself, whilst offending "moral guardians". But look at the response from the town's residents. 100 people complained, 177 people were in favour. Peter Rawle, Ilfracombe town councillor wrote: Yes, Yes, Yes. David Hancock wrote: Let's hope this statue is the first of many new and great things to come to Ilfracombe soon. We need to stop dwelling on the past and move forward. Philip J Milton wrote: Overall I think it will be good for Ilfracombe and will attract visitors to North Devon keen to see it. Indeed I can see 'her' even becoming a fun fertility symbol so couples flock here to touch her. Better yet it could work in that being able to relax in our beautiful area may well help to make things happen for couples having difficulties. I think it is far more likely that it will become a gathering place for the town's chavs to copulate while drunk. Luke Faulkner, 17 wrote: Being a town which is home to an arts college I believe that young people need to be exposed to real pieces of high end art in the town, I believe it should be out of the question whether we have this piece or not – it should be a privilege to the people of the town to have this piece. * Let us be precise. The odds are Damien Hirst has not "made" anything since he was at art college. Instead he will sit around coming up with "ideas", which he will then pay other people to make. I actually have a friend from art college who makes his living in the exact same way, coming up with bizarre and confusing objects which he pays other people to manufacture. What is quite interesting is that the objects are absolutely meaningless. I think we have Charles Saatchi to blame for the success of this individual (along with that of the equally talentless Tracey Emin). That certainly was a good essay from Mark Anthony Signorelli and Nikos A. Salingaros. Very well written and with very good points about the tyranny of modern "art". Also, as you said, nice to see the author respond to some sensible comments. Perhaps this is something we will see referenced in a future Dalrymple essay. Wonderful. A moment of thuggish petulance in a football match becomes a cultural icon. For decades the authorities have been battling against football hooliganism and now they go and do this. I can't believe Tracey Emin is Professor of Drawing at the Royal Academy. Their name was inspired by Tracey Emin, a woman of slight talent who became famous for exhibiting her filthy unmade bed and is now – shockingly – Professor of Drawing at the Royal Academy. At the request of our Prime Minister, who was trying to show he was edgy, she installed a silly neon light in Number 10 Downing Street which recommends “MORE PASSION”. I've had reason to look at Twitter recently. Unfortunately, almost every "tweet" by anyone who is anything to do with the arts is either the same predictable leftie rubbish, or completely inane and trivial (often the two combined). One person I noticed is this chap, who projects his own messages onto beautiful architecture which he himself could never design or make, and which I presume he regards as old fashioned or oppressive. Here's one of his pearls of wisdom. What's that supposed to mean, exactly? Don't we all?! What should we do, perhaps? Explain to the Iranians, the Chinese and the Russians that we and the United States are simply going to get rid of all of our armies on these grounds and hope for the best? Modern art often seems to me somewhat childish. Silly, idealistic, not of any practical use. Lacking sophistication. Like a mere shout, without meaning, as an Emotivist would say. Update, here's some pure sexism from the same man. You can see more of what he calls his "work" on his site - including, apparently, lines of Arabic projected into St Paul's Cathedral and such profundities as "All men are dangerous". Furthermore I have just discovered from his sycophantic Wikipedia entry that his offerings are not always (if ever) unofficial. No, he has numerous prestigious patrons and is commissioned by the likes of the Royal Opera House. Damo wrote: I can't believe Tracey Emin is Professor of Drawing at the Royal Academy. That really is a cultural nadir which beggars belief. Gavin wrote: That really is a cultural nadir which beggars belief. But you have to admit that there is a sense of artistic unity about placing this sculpture in front of the Pompidou. The sculpture is tastelessly executed, notwithstanding its theme of poor sportsmanship; the building is merely its architectural predecessor and reflection: brutality in metal and glass. I see modern art pieces if this type and think that I would have much more respect for sporting culture if it promoted a mindset of health and physical fitness to complement mental fitness. Instead the citizens of Paris get Zidane's bald, and I suspect empty, head in its basest use as a blunt weapon. I never cared much for Paris anyway. She photographs herself over and over again, in different costumes. In "Unlearned Lessons of the Twentieth Century," Chantal Delsol observes that our current condition is to live in a flood of images which only mask an inner emptiness. There must be good artists at work today, but they don't seem to get promoted. "One of the most influential artists of our time", no less. She dresses up. Big deal! Needless to say, that's not art. It's not anything special. Somewhat pitiful really, especially in that she clearly tries to shock too (see the disclaimer). I pity her, but have stronger feelings about those who actually promote such pretentious mediocrity when they should call it for what it actually is. I would hate to have to see his horrible ‘sculpture’ every day. It looks like a murder victim on a pathologists’ slab, literally obscene in that it is the sort of thing that should normally be kept out of sight. Scroll half way down the page to see the statue. 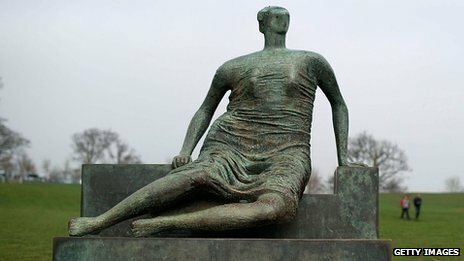 This ugly sculpture was made by a socialist and installed on a council estate in the 1960s where it was promptly vandalised. I'm not sure if the head always looked like that but since the artist was a "progressive" it might well have done. The Muslim Mayor of Tower Hamlets in East London now wishes to sell the sculpture. This should surprise no-one but it does surprise socialists such as Danny Boyle, who has got involved to try to prevent the sale! There is a such a rich combination of stupidity and naiveté in the situation I have described above that I don't know where to start. Maybe I just haven't got the time.